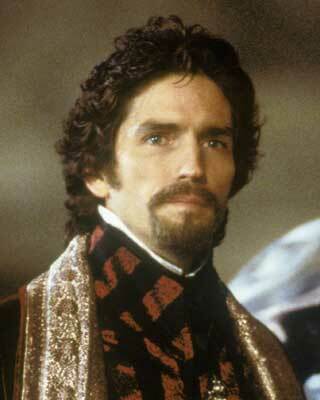 I stayed up 'til 3:30 am this morning watching The Count Of Monte Cristo with Jim Caviezel. I remember seeing it for the first time in the theater in 2002. I melted as soon as he walked on the screen. From then on, I was enthralled with Jim Caviezel and I've wanted to see all his movies. After he played Jesus in The Passion, I tried not to think of him in a yummy way. ha! But he is yummy! Then last night while I watched The Count again, and I realized, I am in love with that character! It's not Jim Caviezel the person - it's The Count! He just melts me! I love it when he walks into the room with that long robe on. His hair is incredible - his eyes divinely blue. When he was clean-shaven at the end and looking more like the real Jim, I wanted The Count back. I kept replaying the scenes with him dressed as The Count over and over. And over. And over. I kept saying aloud, "he's so pretty." Have you seen this movie? It's 99.9% squeaky clean. I think anyone would love it. It's a wonderful story of good vs. evil. Hmmm...hope my husband doesn't check my blog today! There are more but those are the ones he was featured prominently in. You are cracking me up girl! I didn't realize he had been in that many movies. I just knew about The Passion and Angel Eyes. What else has he been in? Maybe you could buy Mike a long count like robe to wear around the house! LOL! He is pretty. Those eyes are amazing. The Count was a great movie and he was really good in it. The only thing I had seen him in before that was Frequency (which I LOVE) and part of Angel Eyes. He impressed me it Count. I haven't seen Passion yet though. He does have great hair in the Count. I'm all about the hair. I watched the ending of the Count just the other night after dh went to bed. Gosh that was a fabulous movie. So many good lessons in there. I really want to read the book sometime. I also loved Frequency- really interesting- and of course, was moved in so many ways by The Passion, which was how I first came to know about Jim. I was so impressed with the interviews I saw leading up to the release of the Passion. He is an amazing man of faith. Haven't seen Bobby Jones and I will not be seeing the Thin Red Line, not a big war movie gal. I really need to get through Mad Hot Ballroom this weekend. I've had it from netflix for WAAAY too long. Have you seen it? Check it out, Tracie. I think I need to check out some of these movies. I loved Count of Monte Cristo (the book is good too), so I need to watch some others. I especially want to see Frequency. I know I'm like behind 10 years on movies, but still.... I just thought I'd reply to your blog since I a) updated my blog (so there!) and b) wanted to see what was up with you. Looking forward to our day trip on Monday!